In 2015, the FCC signed off on Net Neutrality, regulations to ensure that you can access all websites and services equally. That means that your ISP can't block or slow down access to particular sites or services. If ISPs could charge content providers, like Netflix, to deliver its service at higher speeds than other services, then you might have to pay extra. Or, what if your ISP decided it wanted to block data or slow it down from a site or service? Should your ISP be able to decide what you can watch? Or what if your ISP decided to block Gmail to encourage you to use its own email service or charge you an extra fee to access Gmail. On the other side of the equation, your ISP could slow down Netflix to the point that it's unwatchable unless Netflix pays for faster access — a cost that would likely be passed on to subscribers. Without net neutrality, the internet could get a lot more expensive. 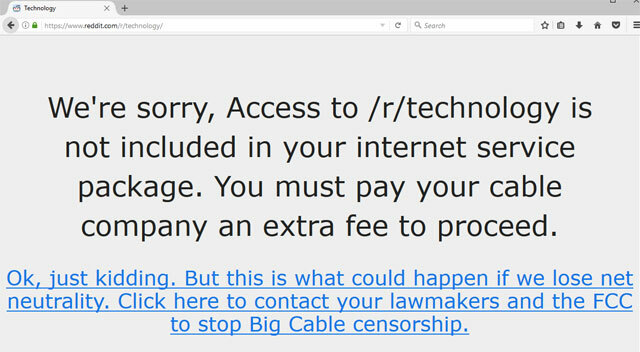 Today, Net Neutrality is jeopardy and major websites are participating in the Net Neutrality Day of Action to remind you of what the internet could be like without net neutrality protections. That means you may see slowdowns while browsing today. Right now, net neutrality is protected by Title II of the Communications Act, which considers ISPs "common carriers" and subject to regulations similar to utility providers. But critics call the regulations burdensome, and the FCC is currently in the process of removing these regulations, which could make the internet a very different place. The Net Neutrality Day of Action comes just a few days before the public comment period on the FCC's net neutrality rollback proposal ends. Over six million comments have been submitted so far, and you can add your voice by going to the FCC website and clicking "Express" in the Docket 17-108 box on the left. But whether you add your opinions or not, the internet will look a little different today. 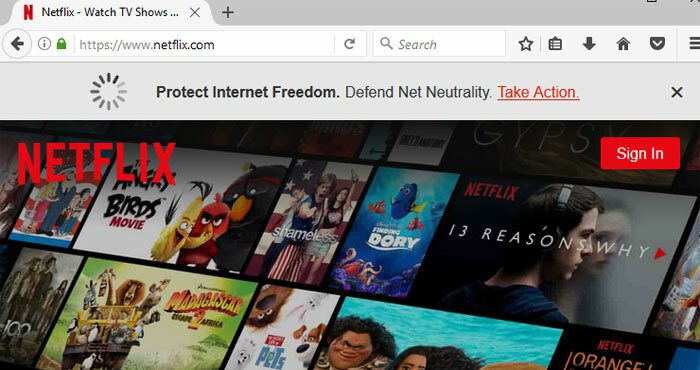 Some of your favorite websites are participating in the protest, including Amazon, Google, Facebook, Twitter, Netflix, Etsy, Foursquare, Pinterest, Spotify, and even AT&T, which claims to support the concept of net neutrality even though it's against Title II regulations. This is being blown out of proportion. They only shared just enough to get us riled up instead of the whole rules. What else was there they didn’t show? Besides, the rules in question never made it to the stage where they we’re implemented let alone enforced. NN looks good, but the strings attached weren’t worth it.